The 2016 Annual Jewish Film Festival will feature a fim on each of the nin Sundays in January and February. The festival begins on Sunday, January 3 with a 1:30 pm showing of “The Precious Wife.” The shory of an Israeli doctor, his Palestinian wife and child with serious birth defects reveals the profound biases each faces as the explore friendships and a place they can live together as a family. “Nicky’s Family,” set for Sunday, January 10, tells the story of Great Britain’s Oskar Shindler. Nicholas Winton, the organizer of the Kinder Transport that took 669 children safely to England during World War II. Winton died during the production of this film at the age of 106. “Nicky’s Family” has won the most awards at every film festival in which it has been entered. The 11 members of the selection committee viewed more than 60 films before they settled on the final program of dramas, documentaries and comedies, says festival chairperson Joe Gottesman. Each year, a large portion of the proceeds are given to local charities, including the Cruz Roja. 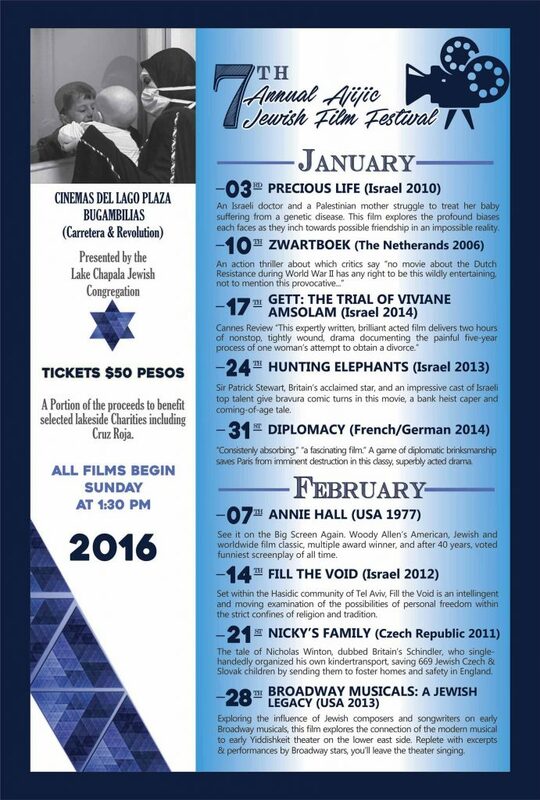 All movies are shown at Cinema del Lago in Plaza Bigambilias on Sundays at 1:30 pm.